Originally published in 1995. V. S. Naipaul, a Trinidadian of Indian descent living in the West, has written in many forms. 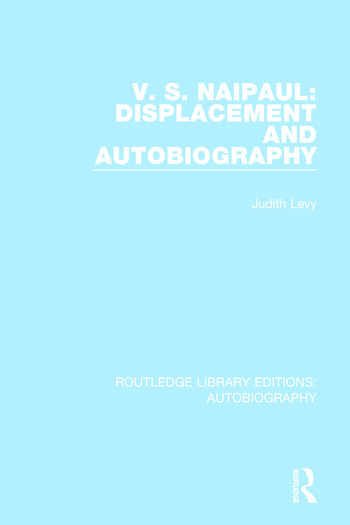 Through an analysis of five works by Naipaul written in different modes and periods of his life, this study posits a relationship between a cultural condition and a choice of genre and narrative, or more specifically between cultural displacement and the writing of autobiography. Examining an aspect of Naipaul’s development as a post-colonial writer, this book is of interest in exploring the way that concepts of self determine the writing of texts. It considers ‘deflected autobiographies’, genre boundaries, quests for origin and expression, and Lacanian psychoanalytic theory. Dr Judith Levy specializes in the novel, particularly the Post-Colonial novel, and teaches at the Hebrew University or Jerusalem.